Before the trend toward specialization—before the hard-boiled dicks, before the Skylarks and Lensmen, before the Shadows and Spiders—pulp magazines offered escapist fiction that appealed to readers of all stripes. Virtually every story was suffused with the spirit of adventure; beyond that there was great variety in theme and setting. Qualities that became pronounced during the era of genre pulps were already evident in rough-paper yarns of the 20th century’s first two decades. Sadly, many great stories from this period are unknown to today’s pulp aficionados, especially inasmuch as the issues in which they appeared are hard-to-find collector’s items. Each book, measuring six by nine inches, utilizes the same cover design. Each is numbered on the spine, alphabetically by author. Each has an informative introductory essay putting the novel and its author in proper historical context for maximum appreciation by readers. Stories in the “Forgotten Classics” series take place in a variety of locales: India, the Appalachian Mountains, the American West, the Gobi Desert, the Canadian northwest, the French Riviera, the South Seas, colonial-era Kentucky, and a mythical Balkan state. Within the group a reader will detect genre elements that would become more distinct and pronounced in pulp fiction of subsequent decades. But each novel is, at its core, a rousing adventure story clearly and vividly told. You’d never guess these gems were written a hundred or more years ago. Murania Press has previously published four of the listed novels in its “Classic Pulp Reprint” series. Those books, now withdrawn from circulation, sold for $20 per title. Each of the “Forgotten Classics” volumes is priced at $16, and the entire set of ten will be available at $120, which includes shipping to buyers in the United States. 1. H. Bedford-Jones, The Wilderness Trail. Originally published in the February 1915 issue of Blue Book. 2. B. M. Bowers, The Spook Hills Mystery. Originally published in the November 7, 1914 issue of The Popular Magazine. 3. George Bronson-Howard, The Return of Yorke Norroy. Originally published in the October 1908 issue of The Popular Magazine. 4. A. M. Chisholm, Fur Pirates. Originally published in the October 20, 1915 issue of The Popular Magazine. 5. J. Allan Dunn, Barehanded Castaways. Originally published in the December 20, 1921 issue of Adventure. 6. George Allan England, The Elixir of Hate. Originally published in the August-November 1911 issues of The Cavalier. 7. Francis Lynde, B. Typhosus Takes a Hand. Originally published in the October 20, 1921 issue of The Popular Magazine. 8. 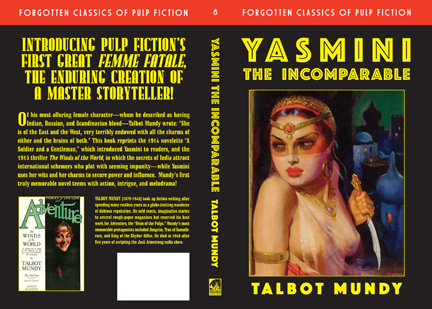 Talbot Mundy, Yasmini the Incomparable. Originally published in the January 1914 and July-September 1915 issues of Adventure. 9. Perley Poore Sheehan, The Abyss of Wonders. Originally published in the January 1915 issue of The Argosy. 10. Gordon Young, Savages. Originally published in the May 3, 1918 and July 18-September 3, 1919 issues of Adventure. Several of those sound interesting. Hope to get some soon. Looking forward to ordering YASMINI THE INCOMPARABLE! Yasmini the Incomparable is high on my “to buy” list, along with 2-3 others.